1. Increase team contribution to the company's "bottom line"
* Transform stressful work places into fun again. Most Training materials today are PowerPoint� presentations... a simple slide show. Bill Gaw's Kaizen Management, PowerPoint Presentation on the other hand includes 44-powerful, PowerPoint graphics, "plus" annotated note pages with explanations, and "lessons learned" by a "been there, done that" professional. A value added, learning experience on "how to" design, implement and deploy a Kaizen Event for individual and company success. And delivered via the Internet to you within 24 hours. The key to any kaizen program is the problem solving process. Most processes follow the standard Plan-DO-Check-Act (PDCA) cycle whereby the self-directed teams plan and stipulates not only the targets but also an action plan to bring about improvement. Once the plan has been implemented a team auditor must check whether the desired improvements have actually been achieved. In the fourth step the new operational processes are stand-ardized so that the original problem is not repeated and the improvement is secured. Lesson Learned: The eight step problem solving process displayed in slide 10-17 covers both problem identification and problem solving. It provides a more detailed course of action than the simplified PDCA cycle. It is essential that all people be trained in the process of problem solving. It represent one of the best time investment ever made by a business enterprise. 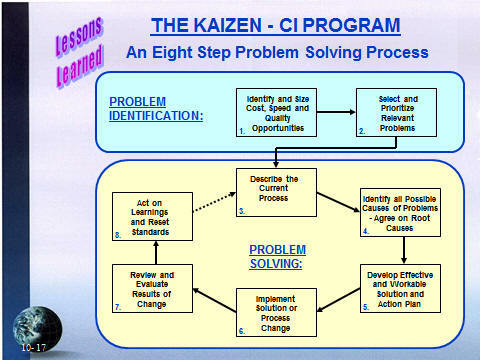 A kaizen tool kit is presented in slide 10-18. Some of the key kaizen tool applications are explained below the graphic. "Your Training Presentations are the easiest and fastest way to understand the practicalities of business processes that I have seen in many years of management consulting activity. I intend to use them in my practice, if you are agreeable, since I am now extending into new consulting areas." Much less than you would imagine. In fact, we make the Kaizen PowerPoint-Plus, Training Presentation affordable so that it can fit easily within your personal or your company's training budget. We want you and your company to hear what Bill has to say about Kaizen and the best way to do that is to make it affordable. That's a 31% discount and hundreds of dollars less than relevant seminar fees. And with Mr. Gaw's expert commentary and "lessons learned" it's like attending a seminar in person ... having Bill guide you personally through the techniques and processes. We are so sure that your training module will have the impact you desire that you can order entirely at our risk. This Kaizen, PowerPoint-Plus, Training Presentation comes with a No Risk, 100% Unconditional Money-Back Guarantee. Believe this, we will never consider your purchase binding until you have reviewed all the material and put it into practice. We know that you, like our other customers, will be thrilled with the results. In fact, we are so convinced that this Kaizen, PowerPoint-Plus, Presentation will work for you that if you aren't completely satisfied for any reason, we'll immediately refund your purchase price. You simply can't lose. "Much better than attending a seminar in person because you progress at your own speed and you end up with the best possible set of notes for future reference." Paul Howard, President, Eaton Leonard Tooling, Inc. Remember, if you continue to work the same way, you're going to get the same results. The next move is up to you. I've shown you that our training presentation is as risk free as an offer can come. You and I know that if you've read this far, you're seriously interested in bringing sanity to your day-to-day work environment and helping yourself and your company achieve your full growth and earning potentials. * Increase team contribution to company's "bottom line." Should you decide to use your training presentation for in-house training we'll include a download copy of an effective training methodology, a vital "train the trainer" resource.